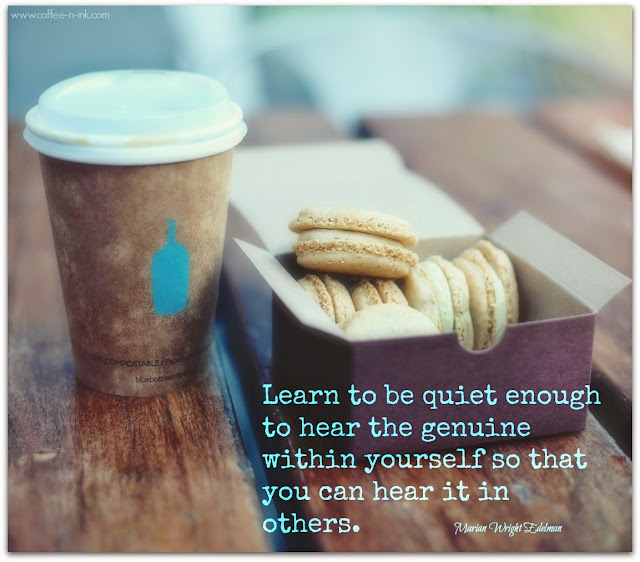 I am in need of some quiet today. I'm anxiously awaiting the moment where I can sit around and just listen to my heart. A moment to sit with a journal and write, write, write. An afternoon to go to the library or bookstore and look for the perfect book to read. A day to take the kids to the park and maybe have a picnic. A day at the beach to dig my feet into wet sand and have the waves splash around me...this is the quiet I need. I have a forever long to-do list of blog posts to write, job duties at work, finals to study for, things to remember before the kids' school ends and I just want to be quiet for a moment. I want to relish in the hush before I have to tackle it all. I'd love some time to just sit with a coffee and breath a little. I was searching for some words of wisdom this morning and found it. Those words were exactly what I am trying to convey today. Just a little quiet to get everything in order before the freedom of summer begins. I hope your day is a breath of fresh air. I wish you a moment of quiet in your bustling day where you can devour the genuine quiet we all crave. Until that moment comes, I'm going back to being a responsible adult and get some work done. Being a responsible adult is overrated sometimes ;) Why did we want to grow up so fast again? Sometimes I wish we could take a break from being a responsible adult and take time to just sit and be quiet! Yay for bluebottle coffee! You're so right on this post! Beautiful. I hope you do manage to get a moment of genuine quiet - it's amazing how much of a difference even 5 minutes to yourself with no distractions can make. breaks can be so needed sometimes! Ah, being an adult is no fun ;) I try to find the bit of quite among the adult life though! I had a moment like that last week. It was so needed! Oh man, I need a quiet day too! I can completely relate!! Between my 2 crazy kids, my photography business and my Rizzmic instructor training, I feel like I don't have a moment alone all day to just sit with my thoughts! I would give anything for a "quiet day"! Gosh. What I wouldn't give for like a WEEK of quiet. But I'd use it to get all caught up in everything thats stressing me out. Growing up stinks! I think we should get matching 'don't grow up, it's a trap shirts'. Hoping you find that quiet soon. We all need it to stay sane. Love you girl. For me quiet might be the most stressful thing. I feel like my mind is always going 90 miles a minute, always anticipating the next post, the next outing, etc. Maybe I need to slow down. Sometimes I am really mad at myself for growing up. Who wants to be an adult anyway!? I just wish we could all have a day, where we can sit in quiet. I really need to find a balance to life where I can just sit, relax and do nothing. I'm at a constant 100 mph at all times and never sit down.